With this offer you will receive (1) Compass Sculpture Box Moments of Faith Sculpture box, an attractive desktop accessory and practical storage. Dark wood box is 8.5" x 5.75" x 2.25" with sculptured lid compass detail and Scripture quote. Moments of Faith Sculpture box, an attractive desktop accessory and practical storage. 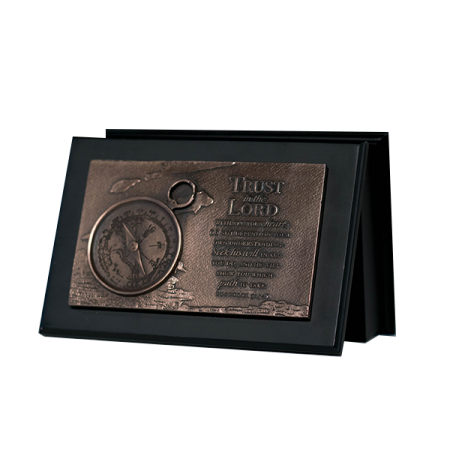 Dark wood box is 8.5″ x 5.75″ x 2.25″ with sculptured lid compass detail and Scripture quote. Dimensional sculpture plaque in bronzetone 3-D design on hinged lid, in resin. Proverbs 3:5-6 Trust in the Lord with all your heart: Do not depend on your own understanding. Seek his will in all you do, and he will show you which path to take.